Capt Larry Hicks, CD joined the Queen’s Own in 1971 as a rifleman and progressed through the ranks quickly attaining the rank of Sergeant within a few years. During this time he was part of the Regiment’s historical and ceremonial guard the Skirmishers including portraying a Queen’s Own soldier of 1885 for the CBC documentary The National Dream. 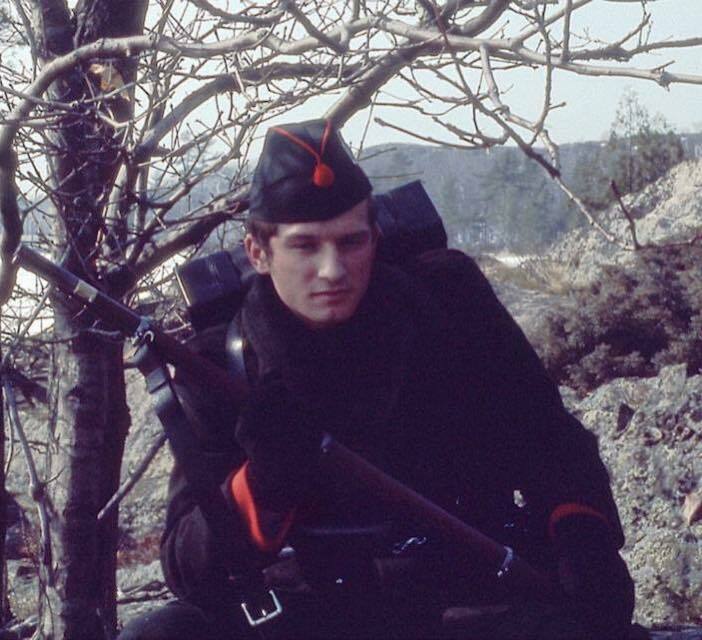 Larry as a Rifleman during the filming of the “National Dream”. Larry was commissioned to Lieutenant in the mid 1970’s and it was in this rank that he spent many years as the Unit Transport Officer managing the unit’s vehicle fleet. During this time he was course Officer for the Toronto Militia District’s first combined Driver (Wheeled) Course. Larry remained a Lieutenant for many years and likely holds the record for longest serving Senior Subaltern. Capt Hicks re-mustered trades to Logistics Officer and was promoted to Captain and was the Unit’s Finance Officer for many years. It was as Finance Officer that he traveled to England and Normandy in 1994 with the Queen’s Own contingent to commemorate the 50th anniversary of the D-Day landings. Larry spent the last few years of his 40 year military career at the 32 Canadian Brigade Group Battle School where he was Course Commander for numerous courses including the Basic Military Qualification for new recruits. It was through the regiment that Larry met his wife Lee who was one of the first female QOR band members at the time. In his day job, Larry was a police officer with the Toronto Police Services, he spent 15 of those 37 years as a crime scene Detective retiring with the rank of Sergeant. Larry began volunteering at the Regimental Museum at Casa Loma in 2013 shortly after retiring from both the police and army. Along with other duties, he photographed, scanned and processed thousands of photographs and objects and was the prime curator of the Museum’s Flickr site which has over 11,000 photos uploaded mostly by Larry. He put in well over 800 hours of service for the museum since 2013 and in 2018 was recognized by the Commanding Officer with a Certificate of Commendation and Command Team coin. Capt Hicks passed away on 23 March 2018.